São Paulo firm Andrade Morettin Arquitetos has encased exhibition spaces at this cultural centre in the city in a huge red wooden box, which can be glimpsed through the building’s translucent glass walls. 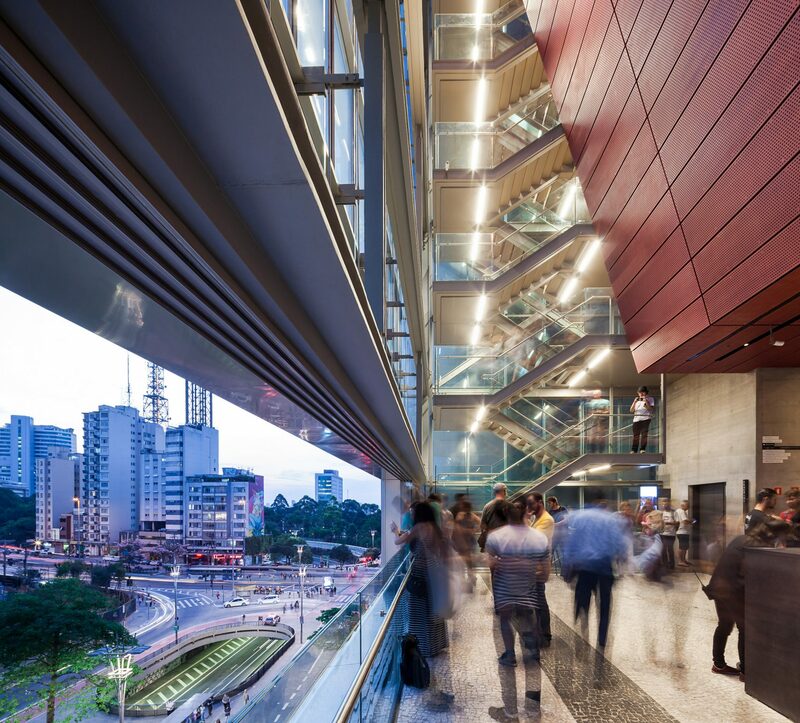 The studio designed the 8,662-square-metre IMS Paulista for the Moreira Salles Institute– a major Brazilian cultural organisation. It includes a library, auditorium, cinema and exhibition spaces to showcase its collection of photography, literature, libraries, visual arts and Brazilian music. 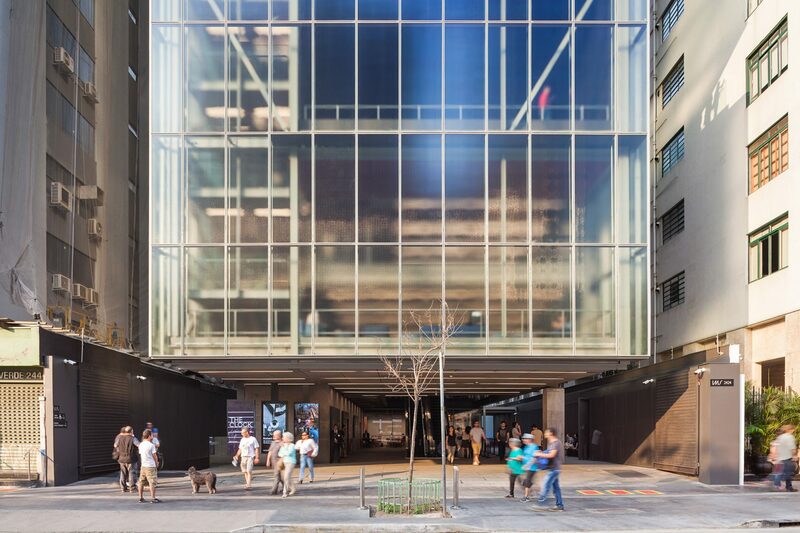 “The Moreira Salles Institute is a consolidated institution with strong presence in the cultural scene in Brazil,” said Andrade Morettin Arquitetos in a statement. 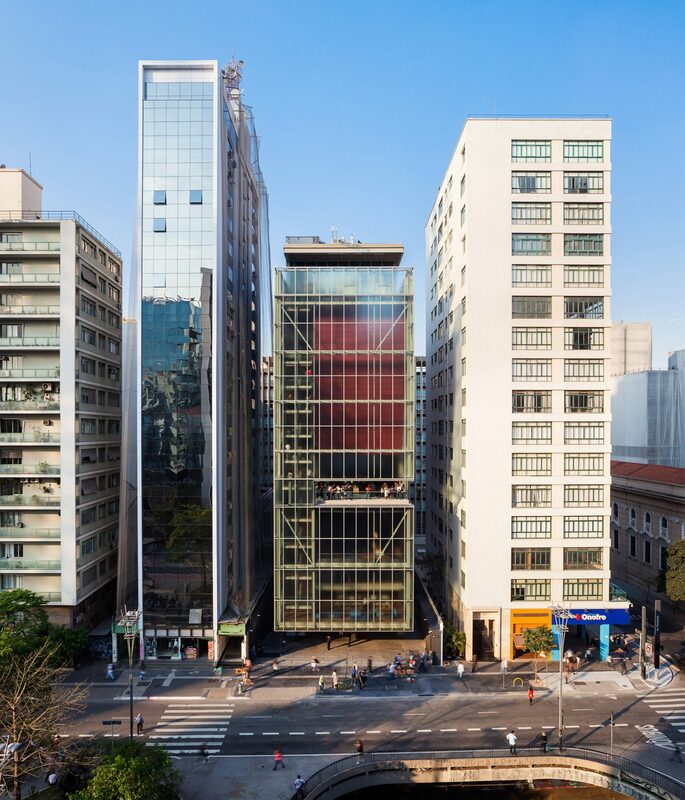 The museum is located on Paulista Avenue, which the firm describes as one of the city’s “most interesting and lively spaces”. Its plot measures 20 by 50 metres, and is surrounded by buildings ranging in height from 13 to 18 storeys, which limit views. To resolve this, the firm raised the museum inside the building to 15 metres above street level. “With this shift, we have left a claustrophobic and restricted condition imposed by the limits of the lot, to gain the views of the city, while creating the possibility of a new articulation of the internal spaces of the museum,” it said. Translucent glass walls wrap around the modular steel structure, partially obscuring a large volume clad in perforated MDF panels painted red. This box houses the exhibition spaces, and its underside is angled gently, above a foyer at the top of escalators. At this level, a slender horizontal opening is cut into the form of the building to bring air into the gathering space. 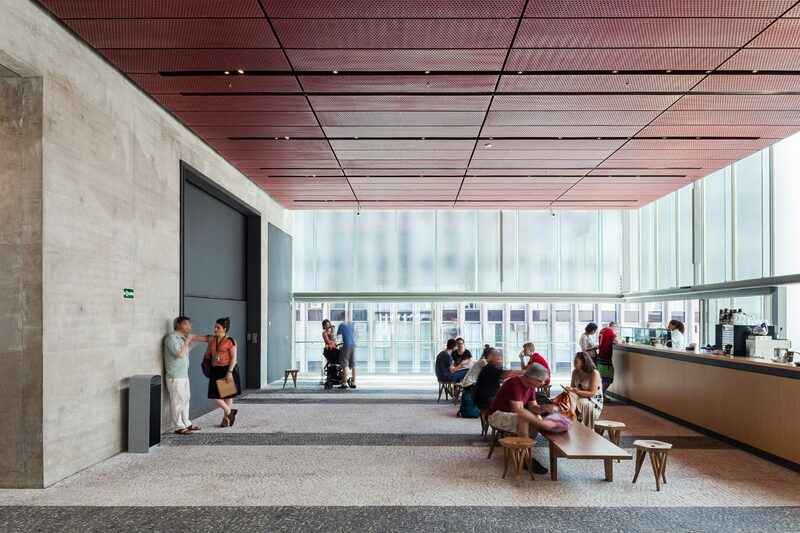 It also marks a change in function between the museum above and public spaces below, which include the library and reading rooms, then an auditorium and a seating area in the lowest portion. The modular structure is divided into double-height floors so that these spaces are light and airy. A slender staircase runs all the way on one side to connect all of the floors. The building is also raised slightly above the ground to form a covered link from Paulista Avenue. A simple aesthetic is created by exposed steel work, glass, concrete, and wooden flooring. More red MDF panels can be found across the ceiling at the entrance to the building, and in small amounts elsewhere. 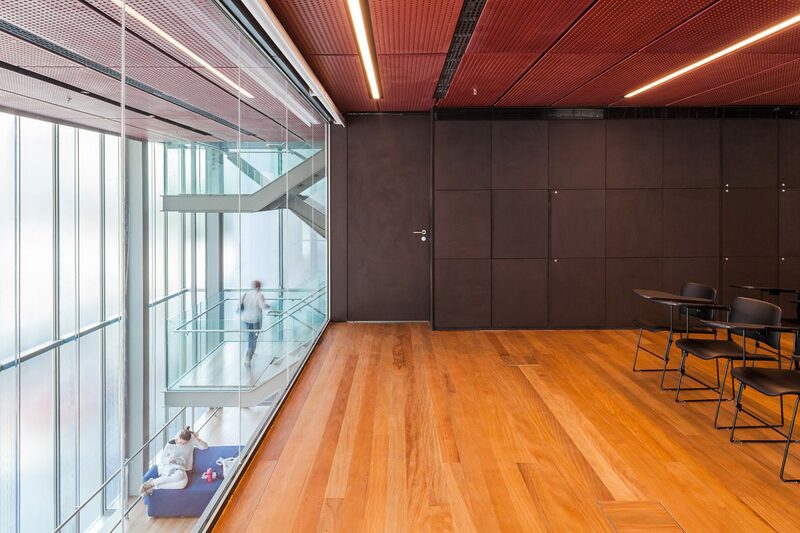 Black shelves decorate the library and black acoustic wall panels feature in the theatre. 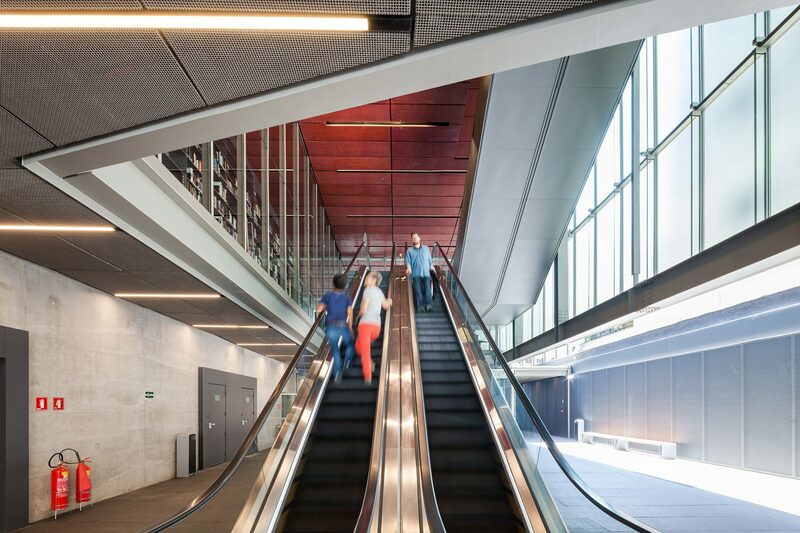 IMS Paulista is among the finalists competing for this year’s Mies Crown Hall Americas Prize, along with Washington DC’s African American history museum, a leisure centre designed by Brazilian architect Paulo Mendes da Rocha, and three others. 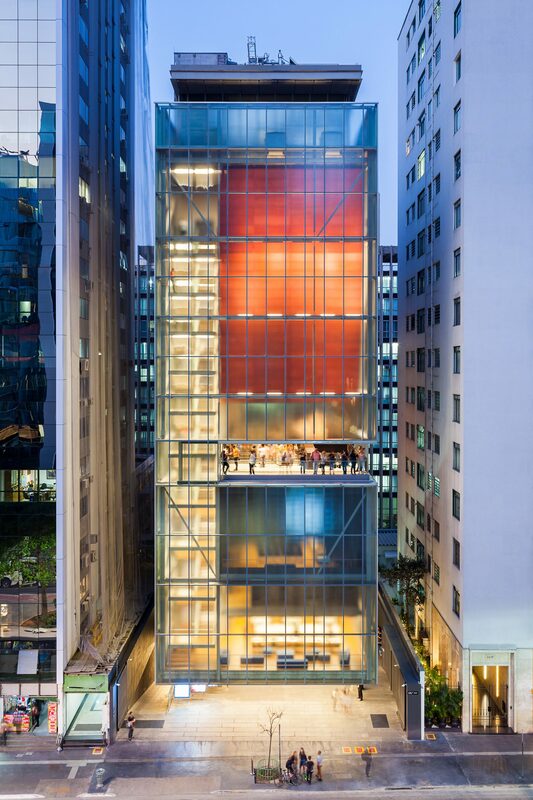 Be the first to comment on "Red box houses galleries at Andrade Morettin’s IMS Paulista in São Paulo"